Chloe and Rantz are two teenage vampires, just trying to live their lives in a world where most people don’t even realize vampires exist. High school is difficult enough, but now they’ll have to juggle homework and tests with vampire hunters, emerging powers, and their thirst, with only an apathetic mentor to guide them. Every vampire universe is a little different, and there's no objective True Vampire. These are the rules of this particular webcomic. The average person doesn't realize that vampires exist. Sure, they're on TV and movies, and some goth kids like to claim they're vampires, but they're basically a myth. The only ones who know the truth are the vampires themselves, and the hunters. Usually, if you're not Rantz, vampires keep their identities to themselves. Origins: How a vampire is created has yet to be revealed, but simply draining the blood of a victim is insufficient. -Shape shifting: The power to take the form of different animals. Weaknesses: Everyone has a weakness. 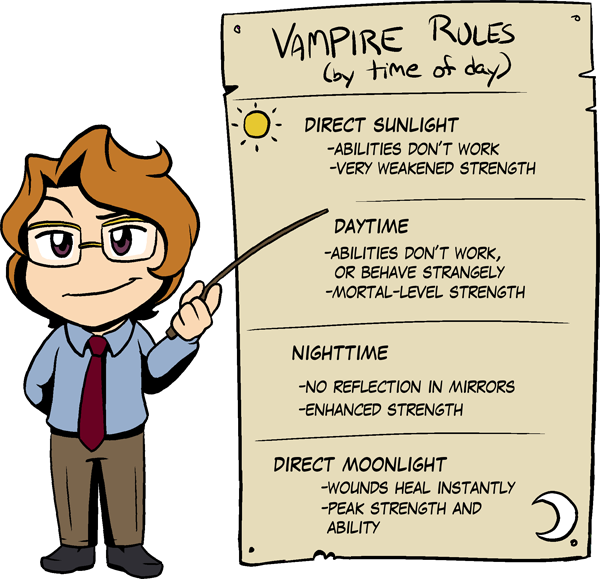 In Vampire Bites, sunlight doesn't automatically turn a vampire into dust and ash, but it does hamper them significantly. In addition, contact with silver in any form will burn at the touch, and wounds inflicted with silver weapons do not heal rapidly. What kills vampires has yet to be revealed. Recently, Arak's discovered a strange stone seal that inflicts damage on contact. Society: Vampires are mostly individual creatures, but when a vampire creates a fledgling, they usually take on the task of training them. Adopting "orphaned" young vampires is usually unheard of. There is also a group known as The Endless. They appear to have some sort of organization, and set out tasks for its members. They remain shrouded in mystery.